A Web 2.0 IPO Breakout? Here is a Web 2.0 stock that could have the potential of breaking out to the upside, Zillow (Z). Check out the video. Here are some price levels to watch for the next week on AAPL. Video posted. If you do not see the video player on the screen, click the title and it will take you to the blog page to view the video. After a prolong downtrend, the natural resources sector appears to have bottomed. Here is a look at some natural gas and coal stocks. Click on the title if you do not see a video player on your screen. 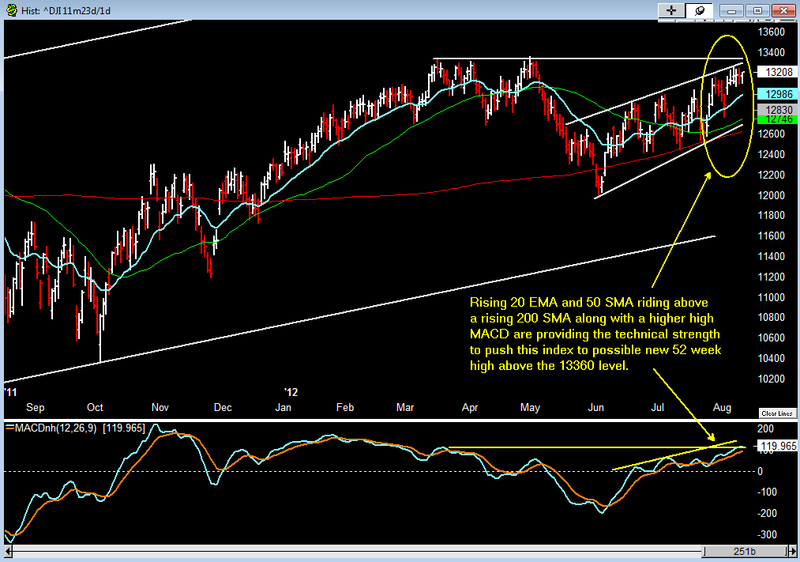 The market is showing sign this uptrend is due for a rest. The SP500 and Nasdaq 100 printed a bearish outside day (engulfing candle). 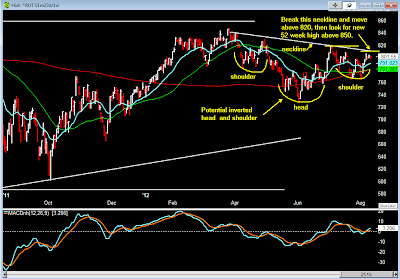 In addition, AAPL IBM GS and many other stocks are showing exhaustion to the upside. But, gold and silver are breaking out. Here are the video highlighting today's price actions and the possible support levels. Click on the title to view the video if you do not see a video player on your screen. AAPL finally broken out and took out the previous all time high. 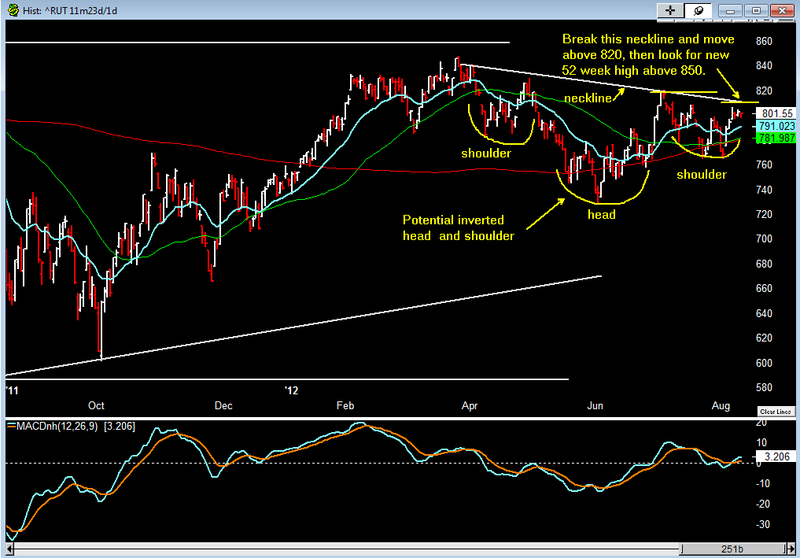 Looking at the head & shoulder or the cup & handler price pattern, the measure move is pointing toward 700+ level. Watch the video for more details. So far for the month of August, the market has been trending higher and getting near the 52 week high made in April of this year. 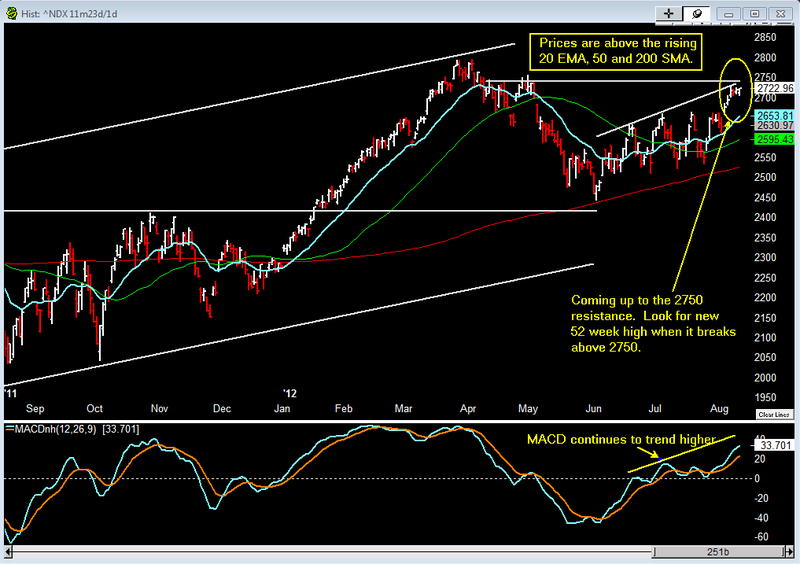 But, the market is putting up a caution flag as it attempts to make a new 52 week high. Here is a chart of the SP500 showing the Advance/Decline line is confirming the upward trend as the index and the A/D line both trending higher. The caution sign for the SP500 is the lack of expansion on the number of new high as the market is getting close to the 52 week high. This uptrend could come to an end unless the number of new high starts to expand. 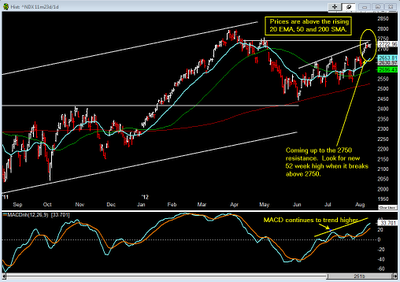 For the Nasdaq, the caution sign is more concerning. 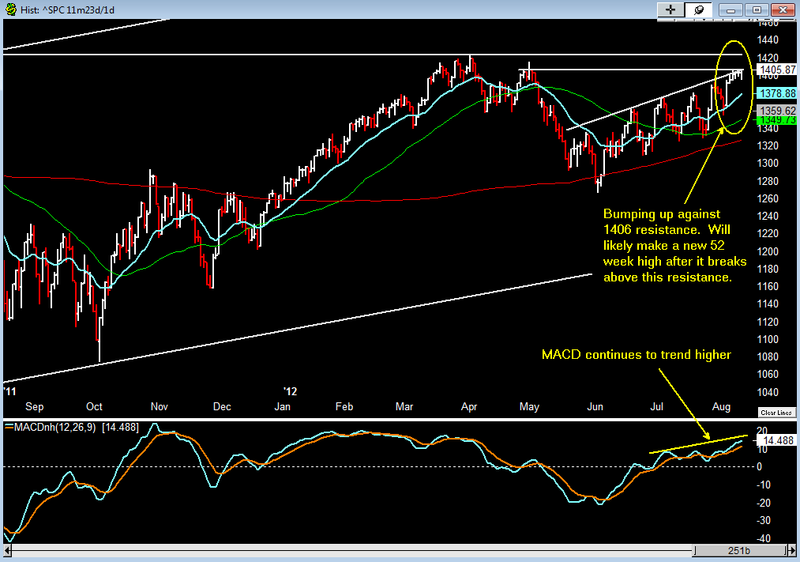 Not only the number of new high is not expanding as this index is approaching to breach the 52 week high, the A/D line is showing a negative divergence. Until these technical cautions have been resolved, tighten up the stops and be patient on buying dips. Here are couple video highlighting some of the stocks and ETF on the move. As the US economy continues to limp along with the backdrop of unresolved Euro zone financial meltdown, and a slower growth China, the market continue to move toward a possible new 52 week high. The SP500 has been chopping higher and now it has reached the 1406 resistance level. The rising 20 EMA, 50 & 200 SMA, and a higher MACD are providing technical strength to help push this index toward a potential new 52 week high. 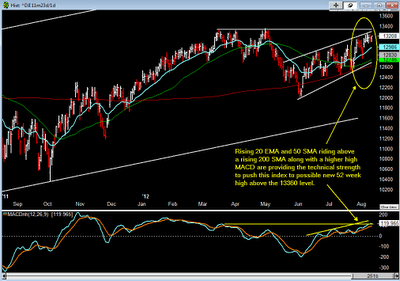 The Nasdaq 100 is also coming up to test the 2750 resistance level. Having a rising 20 EMA, 50 & 200 SMA, and strong rising MACD, it appears it will likely break the 2750 resistance and move toward a potential new 52 week high above the 2795 level. 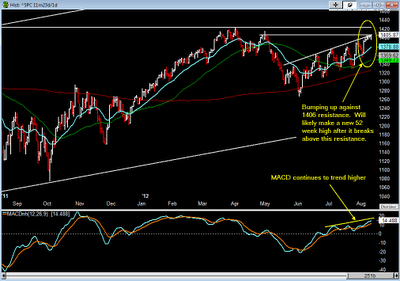 The DJI is only less than 160 points from a new 52 week high. The Russell 2000 is the only laggard amongst these major market indices. But if it breaks above 810, then it could be completing and breaking out an inverted head & shoulder, and this could potentially lead to a much higher level than the 52 week high near 848. Even though the market has been moving higher, there is still a high degree of skepticism on the recent market rally. But the technical picture is clearly indicating the market want to head higher. Here is a video reviewing AAPL, GOOG, AMZN, IBM and PCLN price action. Here's a video recapping the market activities and what to expect for the coming week.